Glen Park is a small, primarily residential neighborhood in San Francisco, California, named for the adjacent Glen Canyon Park. The neighborhood is nestled at the southeastern edge of San Francisco's central hills, the San Miguel Range. It includes the easternmost peak in that range, known as Fairmount Heights or Billy Goat Hill, as well as the south and east slopes. The neighborhood's streets follow the hill's contours down to a small commercial district ("downtown Glen Park") at the intersection of Chenery and Diamond streets. To the west, the ravine at Glen Canyon Park is the source of upper Islais Creek, which historically flowed through the Glen Park neighborhood (parallel to Chenery and Bosworth) on its way to the San Francisco Bay. 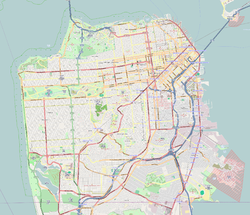 It is currently buried in an underground culvert, although organizations such as the San Francisco Planning and Urban Research Association have proposed to daylight it. Glen Park developed as a streetcar suburb beginning in the 1890s, after the San Francisco and San Mateo Electric Railway opened access to southern areas of the city. Transit was improved further in 1916, when the SF & SM was acquired by the San Francisco Municipal Railway. A branch of the San Francisco Public Library opened in 1927. Today, transit is provided by the Glen Park BART station, the J Church line of the Muni Metro, and several Muni bus lines. Interstate 280 is also nearby. Because of Glen Park's small size and mom and pop businesses, the neighborhood is sometimes described as having a village atmosphere. A multi-use, urban infill project opened in 2006, anchored by a natural foods grocery and a new branch library. Public spaces include Walter Haas Playground, Billy Goat Hill Park, and Fairmont Plaza. ^ "AIDS activist Sheehy to succeed Wiener as SF supervisor". SF Chronicle. Retrieved May 11, 2017. ^ a b "Statewide Database". UC Regents. Retrieved December 29, 2014. This page was last edited on 14 October 2018, at 09:12 (UTC).